I received a review copy of “The Pocket Beer Guide: The Essential Handbook to the Very Best Beers in the World” which claims to be “An on-the-go, definitive guide to more than 3,000 beers from around the world.” We’ll see if it lives up to those claims. This book definitely does live up to its claims of covering a tremendous number of beers from around the world. How definitive the book is could be debated though. It certainly highlights all the major well-known breweries but fails to meet the idea of “definitive” when there is only 1 brewery from the state of Ohio represented (Great Lakes), though I am somewhat biased on that point. Anyone trying to create a “definitive” book about breweries will be out of date by the time it hits bookshelves, so we shouldn’t be too hard on this book about this. It was very enjoyable to read about the brewing scenes and breweries in various parts of the world. So often beer enthusiasts think of beer in a very western concept of the world. We divide things into two sides, European and American. Leaving no room for Latin America, Australia, or Asia which contains the majority of people in the world. The beer culture varies greatly between the Mediterranean and the Pacific. Many Middle Eastern countries forbid any alcohol due to religious beliefs. When you get closer to the pacific things loosen up notably. This is where we learn that the world;s second most populous country, and namesake of America’s favorite style, India barely drinks 3 pints per person per year. China, world’s most populous country, on the other hand is quaffing down enough brew to make it the largest beer producer in the world soon to be accompanied by being the largest hop grower in the world. While I enjoy the broad reach of this book it does not go deeply into any location or subject. It is simply too little info on far too many things. I do think the information contained within could be crucial when traveling the world but unless you’re going on a month-long voyage around the entire world most of the book will be wasted during your trip. This makes me feel like it’d be better suited to be an app, or even a series of apps with one for each country or region. That way when you go traveling to Germany you could quickly access the 32 pages of information on German breweries without lugging around another 290 pages covering the rest of the world. A smartphone app or webpage could also bring searchability to the situation instead of flipping page after page searching for the brewery you’re standing in. However my biggest gripe with this book is the brevity it gives to many breweries and beers. The book is broken down into countries and then regions. From there we dive into each brewery, breaking down their names, locations, brief history of said brewery, and absurdly brief synopsis of the beers. How absurdly brief? Yes, they did give Pliny the Younger 3 out of a max of 4 stars. Never had it myself but from what I understand it’s worth far better than 3 stars, though not necessarily worth the hours some people stand in line in the rain for it. What is perhaps most problematic about this specific beer for me is that this book makes no mention of the rarity of it. Pliny the Younger is released once a year in February in extremely limited distribution only on the west coast, Colorado, and Philadelphia. All leading to the aforementioned hours in line. 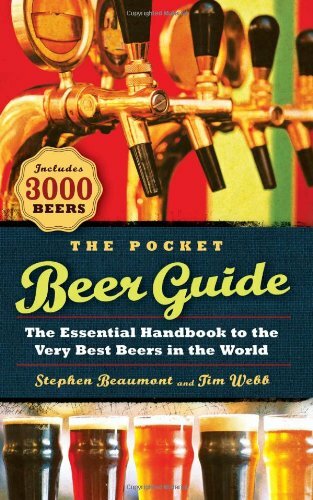 “Pocket Beer Guide” also mentions KBS and CBS in much the same, passingly and unimportant, fashion. This makes me worry for the uninformed reader who walks into Founders and asks for a pint of CBS, which was only released once almost 3 years ago. I worry that they’d be laughed at by the bar tenders or other customers. It would’ve been better, in my opinion, to simply pass over beers like Pliny The Younger or CBS or at least include a sentence saying how rare they are. If you’re lucky enough to be traveling around the world soon you can order this book from Amazon. Previous Previous post: Session #85: Why Do You Drink?